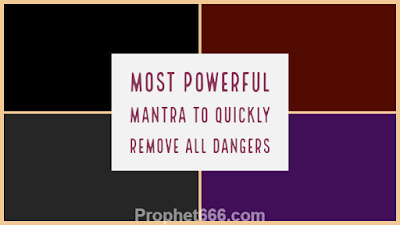 In this post, I have written about a Mantra to quickly remove all kinds of dangers, including dangers from thieves, bandits, criminals, enemies, wild and violent animals of prey and other life threatening dangers. This Mantra is especially useful if you are facing the kinds of dangers mentioned above, while traveling or on a voyage and have very little time to react. Hence, even though, we have published a lot of Life Protecting Mantras and Spells on this site, I have still written about this Mantra because it can be used very quickly and without wasting too much time or energy. And the best thing about this Protection Mantra is that there is no Siddhi Sadhana prescribed for this Mantra. The practitioner has to pickup 8 small stones or pieces of gravel normally called Chote Kankar or Bajri Patthar in Hindi and then chant the Mantra given below 8 times in order to infuse these stones with the force and vibrations of the Mantra. This entire procedure will hardly take any time. If the practitioner is apprehensive about these dangers, then, he can keep the small stones or pieces of gravel in your pocket so that no time is wasted trying to find and pick up the stones. Then, he has to throw the stones in the 8 directions- North, South, East, West, North-East, North-West, South-East and South-West or Uttar, Dakshin, Purva, Paschim, Uttar-Purv, Uttar-Paschim, Dakshin Purva and Dakshin Paschim in Hindi. This simple Mantra Ritual is said to block all the dangers that are threatening the life of the practitioner and protect him from harm. This is one of the Jain variations of the most powerful and effective Chamunda Mantra and can be most effective if used with faith and confidence. The stones should be thrown away. Pranam, so if I were to throw pathar in all directions and then walk away I would be walking off in the direction where the pathar was thrown. Is that ok? That is all right, the moment you throw the stones you are insulated form all directions.